Visitors to Hong Kong may think of Victoria Peak as being the most iconic of the territory's hills and mountains but for people who live here, Lion Rock is far more symbolically significant. It's not for nothing, after all, that one of Hong Kong's most popular and emblematic Canto-pop songs is entitled Below the Lion Rock and that it's the anthem of a classic TV series about Hong Kongers with the same name. a bus stop and behind a high density housing estate! encounters sights like a holy statue behind construction barriers! as help with firefighting or rescue injured (or lost) hikers! Maybe it's my imagination but it sometimes seems like there are more helicopters flying about in Hong Kong's skies these days than, say, two or three years ago. The politically minded -- or just plain paranoid -- might suggest that this is a sign of there being increased surveillance taking place in the Big Lychee in the wake of there being increased opposition to the authorities; and I myself have suspected just that when seeing helicopters flying overhead on July 1st. On a lighter note: more than one person I know has pointed out the existence of a helicopter service between Hong Kong and Macau (though none of my friends have ever thought to foot out HK$4,300 for the 15 minute ride!). In addition, the wags among them never fail to muse that chances are high that many of those going from Hong Kong to Macau by helicopter end up not having enough money -- or, at least, not being in the mood -- to return on the same expensive mode of transportation. Conversely, it would appear to be a sure sign that someone's won big at the gambling tables if he or she elects to make the return trip from Macau in a helicopter! It's probably the case though that the majority of helicopters seen flying about over Hong Kong are actually carrying out more prosaic but more important business. I think here of the helicopters utilized by the Government Flying Services to do such as act as air ambulances for residents of islands like Lamma and Peng Chau which don't have a hospital on them (and even Cheung Chau, whose hospital I get the distinct feeling is neither very big nor all that super well equipped) and help with fire fighting, especially of forest fires that break out during the dry season. A sign that's renovation in progress, Hong Kong style! More than once when moving around in Hong Kong, I've been reminded of something an artist friend once told me: i.e., that it can feel hard to compete artistically with what's considered everyday by local folks. There are times when his words come to mind when beholding beauty in nature (be it in the form of natural formations, flowers, birds or bugs). But I actually remember him specifically talking about human-made objects that could be easily mistaken for installation or "found" art but actually were around for fairly mundane reasons -- and there are indeed occasions when glancing around Hong Kong's urbanscape that I definitely see what he means! Even after spending years living in Hong Kong, they -- and the spiderman-like workers who construct and clamber about them -- remain a source of wonder to me. However visually astounding the bamboo scaffolding and associated nylon mesh or sheets that wraps around building exteriors are to look at from the street (or nearby buildings) though, I do count myself very fortunate that I've not had to live in a building when it actually had the scaffolding and wraps all over it. Among other things, whatever views you have from your window and sense of privacy you have while inside your apartment would be missing for weeks, if not months. So even the thought that your cocooned building will emerge stronger as well as better looking after that work's done -- or that it looks like a large-scale art work -- may seem like scant consolation during that renovation period which also would be undoubtedly pretty noisy! As the temperatures rise during the hot summer months, a number of folks in Hong Kong take to hiking in the late afternoon and even after dark, when it gets to a few degrees cooler than at midday. I, on the other hand, am one of those people who tries to avoid being on a hiking trail after the sun goes down -- and consider it a good thing that, to date, the number of times that I ended a hike that began in bright daylight only after it got dark is not more than five! 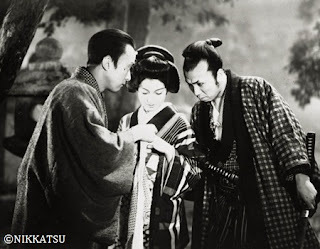 Its English title makes it sound like it'd be a horror flick but Sadao Yamanaka's Priest of Darkness actually is a jidaigeki (period drama) based on a kabuki play by Mokuami Kawatake. One of only three out of the 26 or so films directed by Yamanaka that have survived destruction (on the orders before 1945 of the Japanese government, and after World War II by General Douglas MacArthur), it was made in 1936: one year before the filmmaker revered by the likes of Yasujiro Ozu and Akira Kurosawa was drafted into the Imperial Japanese Army; and two years before his death in a field hospital in what was then Japanese-ruled Manchukuo when he was just 28 years of age. The oldest Japanese film I've ever seen harks back to even older times, seeing as it's set in a feudal Japan where samurai -- both those with a master, and ronin -- roam the streets of a city where dirt covered roads are more the rule than paved ones, and the loss of a prized sword could get a man to contemplate suicide. An ensemble piece with a convoluted plot, it's not the easiest of films to follow -- not least because it looks to have some frames missing at various points -- but has some interesting characters whose paths intersect in ways that contemporary urbanites can well understand. The Japanese title of Priest of Darkness (also) is the name of the story's main character, Kochiyama Soshun (Chojuro Kawasaki). Dressed as a priest when he first appears in the film, Kochiyama actually is a professional swindler -- while Oshizu (Shizue Yamagishi), the woman he shacks up with, runs a gambling joint on the upper floor of her home and a bar on the ground floor. Among the patrons of the gambling joint is Hirotaro, an immature ne'er-do-well who gets himself into particular trouble after he steals a samurai's tanto (short blade) and trying to elope with a geisha. With their parents presumably deceased, Hirotaro's elder sister, Onami (Setsuko Hara) tries as best as she can to be her brother's keeper. But even with the help of Kochiyama and a ronin named Kaneko (Kanemon Nakamura), the best of whose nature she manages to bring out, she finds it hard-going; especially after the innocent seller of sweet sake inadvertently triggers the jealousy of another woman. Just 16 years old when she appeared in Priest of Darkness, Setsuko Hara acquits herself well in a cast that consists of mainly older and more experienced thespians, some of whom were members of the left-wing Zenshin-za theatre troupe that the Japanese authorities didn't approve too much of. Even when in uncharacteristic period garb and a big wig, she's immediately recognizable; possessing an air and luminosity that lights up every scene she's in and incredibly adept at portraying the kind of woman that most men (and some women) would not hesitate to admire, trust and go to the assistance of! Consequently, despite her part being not all that big, I can totally understand why this film -- and, for that matter, The End of Summer -- was included in the HK Cine Fan's ongoing tribute program to the late actress. Put another way: this is a good pick to show that, like just about the only other actress whose charismatic presence has bowled me over even more than Setsuko Hara, she looked to have to be one of those thespians with natural talent that was apparent pretty much from the start. On a more general note: I'm also grateful to this film for introducing me to the talents of a bunch of other folks whose existence I have to confess to not having previously been aware of. And while it's saddening to find out, even so many years after the fact, what happened to Sadao Yamanaka and the majority of his cinematic output, it is actually pretty cool to discover that there are pretty watchable pre-Second World War Japanese movies still available to be seen -- and that they can contain expressions of laudable humanity rather than alien hatreds. Iridiscent clouds over Hong Kong this morning! after it's been (largely) cleaned up? "Give a hoot -- don't pollute!" That was a lesson I learnt as a kid from Woodsy Owl, the owl icon for the United States Forest Service who would appear in comic books which starred his friend and fellow environmentalist, Smokey the Bear (whose own trademark message was "Only you can prevent forest fires!"). And as I gazed out at the garbage floating in the waters of Hong Kong, and also the rubbish strewn on the beach at Chi Ma Wan where I've been regularly venturing to with some others to help clean up this morning, this now adult got to wishing that Woodsy Owl's exhortations had been communicated to -- and impacted -- far more people all over the world. Instead, it often can seem like too many individuals and corporations really don't seem much concerned at all if the planet in which we live gets more and more polluted by the day, hour, minute and even second. In all honesty, there really do seem to be too many people out there who have not been taught to care about the Earth -- or, worse, have had the message imparted to them but still just really don't give a damn. For me, it can be such a crying shame, especially when I'm presented with evidence of how beautiful nature is/can be when humans don't foul it up. Probably due in no small part to today being another mega scorcher, the number of volunteers for this month's beach clean-up was less than half that of the previous two months. Once again though, we looked to have made some difference against the odds -- in that the beach we set ourselves to cleaning-up this morning actually did look noticeably less strewn with plastic containers and utensils, glass bottles and tubes, toothbrushes, ballpoint pens, broken pieces of styrofoam and such just a few hours -- and lots of amount of sweat shed! -- later. Even though it couldn't approach the beauty of the iridiscent clouds we spotted earlier this morning, I still do feel glad to have played some part in helping make the beach look a good deal better than before we stepped foot on it today! And as much as seeing pollution makes me inclined to lose faith in humanity, discovering that there actually are people out there who are willing to volunteer time and effort to help clean up messes that they didn't create can make me feel that all is not lost just yet! The past couple of weeks or so has seen Hong Kong experiencing furnace-like heat. Consequenly, even though the skies have been beautifully bright and visibility's been on the super high side, few people consider it to be an ideal time to go hiking -- and many folks reckon that those of those of us who continue to hike through the summer to be on somewhat certifiable! a war game center rather than anything genuinely worrisome! these houses were older than they in fact are! A quality -- and good value -- meal in a 24-hour sushi restaurant! Would you go to a 24 hour sushi place? It's a measure of how much more there is to Japanese food (particularly in Japan, where regional foods abound) that although I love sushi (and sashimi) very, very much, it wasn't until the fourth evening of my recent Japan trip that I ate a meal that consisted entirely of sushi, and only after I got into Tokyo that I dined in specialist sushi-ya. And it's probably a measure of how much good -- sometimes even great -- sushi and sashimi I regularly get to eat in Hong Kong (as well as on my visits to the Land of the Rising Sun) that only one of the three sushi (and sashimi) meals that I ate in Japan this time around truly satisfied. Looking back, I should have ordered tempura rather than sushi at the restaurant I had dinner in on the one evening that I spent in the mountain castle town of Matsumoto since the former -- rather than the latter -- was its house speciality. On the other hand, I should have been able to expect quality sushi at Ichiba Sushi; not least because it's located within Tsukiji's Jonai Shijo (Inner Market) and is one of the Tsukiji sushi-ya recommended on Yukari Sakamoto's Food Sake Tokyo blog. But that Tsukiji sushi-ya -- particularly, I reckon, the sub-par uni it served me -- not only disappointed taste-wise but actually gave me an upset stomach that required me to run over to use a toilet less than half an hour after finishing my meal! Thankfully though, my third and final sushi meal of the trip -- and, in fact, my final meal in Japan before I returned to Hong Kong -- was the kind that made me very happy psychologically as well as satisfied physically. And the amazing thing was that it was at a 24-hour restaurant just a few minutes walk away from the Shinjuku hotel that I stayed in this time around! The first few times I walked by Kizuna Sushi, I had my doubts about the place. As snobby as it sounds, it actually looked too bright and tourist-friendly to seem like it could serve quality sushi and sashimi to me! But every time I looked through its windows, be it morning, afternoon, evening or late at night, I would see that the restaurant had customers -- and from the looks of it, many of the customers looked Japanese rather than obviously foreign. And after I decided that I did in fact want to have sushi once again for the final meal of my trip and wanted to pick what I was going to eat rather than opt for omakase (as would invariably be the case at a high end sushi-ya), I decided to give this 24-hour eatery a try. Despite Kizuna Sushi offering bargain lunch sets, I decided to splurge by ordering a la carte -- and also treating myself to some junmai daiginjo to go with the food. First, I started with sashimi: specifically, a platter of three different grades of tuna (maguro): akami (the reddest looking meat in the photo at the top of this blog), chu-toro (the medium looking meat in the same photo) and o-toro (the meat in the photo that looks light pink with white stripes). Next up was a few slices of sushi, including one each of awabi (abalone) -- something that's not often seen on Hong Kong sushi restaurant menus -- as well as uni (sea urchin) and ikura (salmon roe), two of my very favorite varieties of sushi. Finally, I had a cooked dish of tsubugai (whelk), which I also do love as sashimi but thought it'd be interesting prepared in a way that I hadn't previously tried before. If I had had more room in my stomach, I'd have gone for sazae (horned turban), a shellfish I like served raw but like even more when cooked (particularly tsuboyaki, in its shell). Sadly, however, I decided that I'd have to save ordering that for another time when I was in a place with that on the menu. While this final meal before I headed to Narita airport to catch my flight back to Hong Kong was definitely of the splurge variety, its price was easily about a third of what I'd have paid if I had had the same meal in a sushi restaurant in Hong Kong that was good -- and specialist -- enough to offer those items. And, actually, I reckon that's true in general of the meals I have (had) in Japan: i.e., even in Tokyo (which one can expect to be more expensive than the rest of the country), they are always a good deal cheaper than what I'd be paying in Hong Kong for food that's the equivalent both in terms of quality as well as quantity! As regular visitors to this blog know, I enjoy making Hello Kitty spottings as much as I do wild critter spottings. So it shouldn't be too much of a surprise to find out that one of the things I like about being in Japan is that I almost invariably will catch sight of Kitty Chan's visage at least once every day that I'm in the country where the headquarters of Sanrio, Hello Kitty's parent company, are located; and this without my having to do such as head over to Sanrio Puroland over in Tama Center (although I have indeed voluntarily done precisely this before). Somewhat surprisingly though, my feeling is that I see more people wearing Hello Kitty-themed clothing in Hong Kong (the city with the same initials as the cute cat character) than in Japan itself, especially Tokyo (where it seems that people tend to eschew wearing clothing without any images on them, even when they're in casual attire). And despite my having read of Funassyi's great popularity in recent years, I still was taken aback at having caught sight of the pear fairy from Funabashi's visage before Kitty Chan's on this recent Japan trip. For the record: my first Funassyi sighting of this recent Japan trip came on the first day and came in the form of stickers someone not official had stuck on an escalator in Tokyo Station! In contrast, everything I saw on this trip that bore the image of Hello Kitty was pretty pukka; with Kitty Chan being at her most official when helping keep roadside construction sites safe over by Shinjuku Station and being featured -- along with a few other Sanrio characters -- on Japanese postage stamps on sale at the country's post offices. Although I've encountered kawaii construction barriers before in Japan, I must admit to still doing a double take when I came across those rows of Hello Kittys by the roadside over in Shinjuku one evening. And what made the whole thing funnier for me was how pretty much everyone else who passed by them treated them like it was the most natural thing in the world for them to be there. Put another way: I seemed to be the only person gawking at -- and snappying photos -- of them! On the seventh day of my recent Japan trip, I continued taking advantage of the excellent value JR East Nagano-Niigata Area Pass by embarking on a day trip to Mito. Food-wise, the capital city of Ibaraki prefecture is known for natto (the fermented soybeans that many foreigners find repulsive), chestnuts (like at Obuse) and plums (which supplied the flavor for the serving of soft serve ice cream I had while there!). But while I like all those things just fine, Mito's main attraction for me really was its Kairakuen; and not just because I figured that taking in some fresh air in beautiful green surroundings might be a good thing to do after my epic evening at Sasagin! Constructed in 1842 on the orders of Tokugawa Nariaki, the then lord of the ruling Mito domain, Kairakuen is considered to be one of the three great gardens of Japan along with Kanazawa's Kenrokuen and Okayama's Korakuen. If truth be told: I wouldn't rank Mito's Kairakuen among the top three most beautiful gardens I've visited in Japan; with Takamatsu's Ritsurin Koen and Yokohama's Sankeien as well as the Kenrokuen and Korakuen having blown me away more aesthetically. Getting close to sake heaven once more at Sasagin! called Glorious Mount Fuji for you to try! fantastic sake -- this one called Eau du Désir! The last time I visited Tokyo before my most recent Japan trip, a friend who now resides in Hong Kong but had previously lived in the Japanese capital city recommended that I spend an evening at her favorite sake bar there. Thanks to her suggestion, another friend -- who has lived in Tokyo for over a decade now -- and I had an evening to remember at Sasagin. So it was pretty much a no-brainer that this Yoyogi-Uehara izakaya would be where we would meet up again for what would be a pretty much guaranteed fun night out. On the evening of our appointed meetup, I made my way to Sasagin on my own; hoping that I'd remember the way to it despite only having been there once before, close to four years ago. Despite our having drank quite a bit that evening in 2012, I found that I did indeed remember a lot about the place (and occasion); with my memory of how the exterior of the bar looked being actually pretty accurate, and with the added bonus this time being that I knew the large cedar ball hanging above its doorway denoted that it was a sake establishment. Thanks to the large amount of time I've spent in the years since at Sake Bar Ginn (a sake bar here in Hong Kong which I probably would never have thought to check out if not for that night at Sasagin that really started it all! ), I could recognize some of the names on Sasagin's sake menu. And I think that my choice of a Dassai 23 junmai daiginjo to start off the evening along with my telling the bar's affable owner who had recommended his bar to me had a bearing on how the evening ended up unfolding! After my American friend joined me at the bar and spoke to him in fluent Japanese, Narita-san (Sasagin's owner)'s beams got even broader. And when we placed orders for such as eihire yaki (grilled stingray fins), and seasonal sashimi (raw seafood) and tsukemono (Japanese pickles), I got the feeling that he decided there and then that we were in the right place. Early on, I noticed that my friend and I were the only non-Japanese at Sasagin that evening. I also got to realizing that quite a few folks there found us quite fascinating -- and, in the case of the woman sitting next to my friend, enough to overcome her reticence to start chatting at length with us (on a range of topics, including the considerable amount of time that -- it turned out -- all of us had spent in the US, different places and ways to find friends these days, the difficulty of speaking keigo, and the amazing as well as amusing pear fairy known as Funassyi)! Maybe it was because we had been befriended by regulars. (Among other things, the woman told us that she and her companion go to Sasagin weekly.) Perhaps it was because we were so obviously enjoying ourselves, the food and the drink. But after our second round of sake orders, Narita-san started pulling out pretty obviously premium bottles of nihonshu and pouring us drinks from them. I have to admit that I actually can't remember the names of all the different nihonshu I sampled that evening (though I can definitely state that the revelatory standouts for me were the Glorious Mount Fuji (Eiko Fuji) sake from the Eiko Fuji Brewery in Yamagata prefecture, and the Eau du Désir (Water of Hope) from the Banjo Sake Brewing Company in Aichi prefecture). Neither do I actually know how many glasses of sake I had that night. But what I do know though is that my friend and I ended up closing down the bar -- and for the record, the only other bar I've ever done this to/at is Sake Bar Ginn! I also remember experiencing some trepidation at how large our bill would be when the time finally came for us to be shown it. In all honesty though, the total damage was far less than I feared that it would be -- considering not only how much my friend and I had drank (and eaten; we also ordered a plate of tempura moriawase that included delicious pieces of frittered anago (fresh water eel) along with the more usual suspects such as shrimp, sweet potato and onion later in the evening) but also the sheer quality of the sake that Narita-san had included in what had amounted to a nihonshu omakase event! Before this second visit to Sasagin, I did wonder how much I'd enjoy it. For one thing, my memory of that first visit was so wonderful that even I got to suspecting that the years had made my recollections more rose-colored than the reality actually had been. For another, I've drank hundreds more liters of sake -- and tried a whole lot of different brands of nihonshu -- since that 2012 evening that effectively amounted to my real, serious introduction to sake.